Want to kill your church? Start a program! What do programs do anyways? 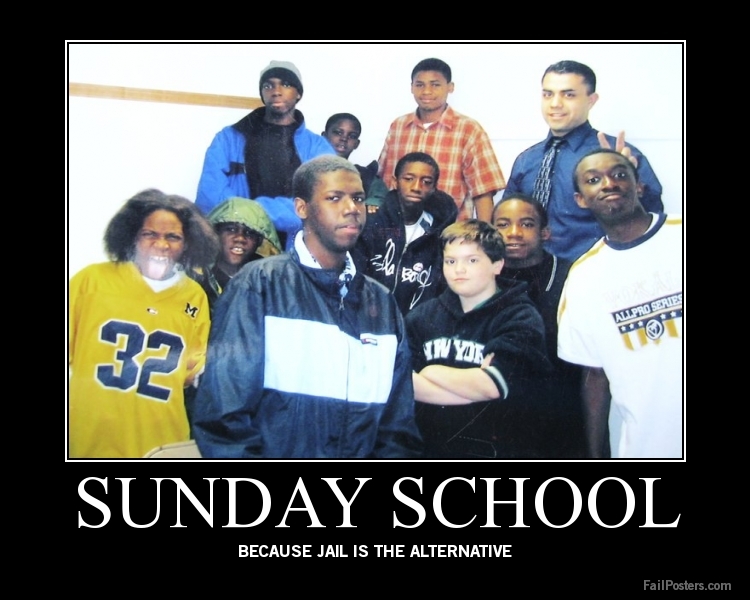 But this is exactly how the most widespread program in churches operates – Sunday School. We just don’t think about what Sunday School is actually doing, and how it is often doing the exact opposite of what we think it is doing. Sunday School is just one of many dreaded “programs” that we use as churches and it is killing us. Churches and Church institutions have been adopting the structures and behaviours of secular organizations for a long time… maybe since the 4th century when Constantine put Christianity in charge of his empire. In the 20th century and into the 21st century, churches are looking more and more like corporations than ever. Pastors and Bishops are being treated like CEOs. CEOs of companies that don’t pay well and expect a lot. Council meetings are more and more business oriented than community and vision oriented. And it is not surprising. Our North American world is becoming more “corporatized” everywhere we turn. So here is the thing about programs. They don’t work. Programs seem like silver bullets or magic wands that will solve our problems. But really programs are the best at helping us to avoid being a real community. Programs, literally, give us words to say instead of our own. The map out our activity, our time, or goals and objectives. Only communities that have forgotten how to be real communities need that kind of help. Programs need to be viewed as what they really are. Crutches for community. Communities that can’t walk on their own use crutches… but only until they are walking again. If we keep using the crutches, we will never walk. Churches and church leaders should be deciding on their own what the vision, value and goals for community are. We should map out our own activities, time and objectives. We should speak our own words, the words passed on in faith through scripture and the timeless Body of Christ to each other. We need to speak with words specific to our context, our time and place. Programs are killing our community much more often than they are helping us to be a community. So let’s give them up. Do I mean that churches need to stop doing all those things I listed above? No. But programs don’t teach our faith or serve the poor or “attract” youth to church or help different generations integrate or deepen our relationship with God and others. Instead, let’s be churches or communities that teach each other faith and learn together. Let’s serve our neighbour together. Let’s help our young find their place among us together. Let’s grow in faith as we worship and share in fellowship together. Oddly enough doing these things as community might look a lot like a program. And if we do these things well as a community together, other communities might look at us and say, “hey, you guys are doing that well, tell us how” and that is how programs are often started. Yet, doing these things together as a community means that we are figuring out how it will work – and work here. It means thinking about our people, not any people. It means planning what things will look like here. And we will start looking more and more like a real community that doesn’t need crutches. Because here is the thing about crutches… Jesus didn’t like them. Jesus just created a community that did stuff together… no program required. A word about programs and generations, this blog is called “The Millennial Pastor”, after all. Programs are a very post-WWII phenomenon. The G.I. generation started all kinds of programs for their kids. Sunday Schools, youth groups, choirs, service clubs, couples groups, singles groups, mom groups, ladies’ groups, etc… And many congregations have a hard time giving up these programs. Soup kitchens, women’s groups, Sunday Schools often have elderly people driving them and doing the work. As often as I am asked the question, “How do we get the young people back?” it is followed by, “They need to come and do their part around here”. Churches and long time members expect their kids and grandkids to come and carry on with the church. Not just carry-on in faith, or gathering for worship, but carry-on the Sunday School, the ladies’ group, the property care, the volunteer programs, the choirs (and their music), the committees and the the financial burden. But the G.I.’s and the Boomers forget that they had the privilege of founding churches, starting programs from the ground and enshrining their passions in the bylaws of the congregation. These pet projects might have to die for the church to survive. Disbanding Sunday School isn’t a failure, it the realization that something needs to die for something new to start to grow. So want to kill your church? Start a program or, even better, keep with the ones that aren’t working. Want to see new life in unexpected places? Start killing programs. What do you think? Are programs bad for churches? Or do we need them? Share in the comments. Previous PostChristians are not good at asking, “why?”Next PostA young male pastor’s thoughts on women in ministry: What is the problem? I agree that when programs are done well, they are important. but so often today we look at how it’s going to attract individuals to come to church by the coffee and donuts, or cool slide show, or cool worship band, or cool “atmosphere” and we forget that we are in church to build relationships with one another and with Christ. I pray that this changes, that we continue to seek out relationships with one another over making something attractive. Simple but not easy. Human beings like to make things about ourselves. Luckily we have the spirit to prod is in the right direction.